Sometimes in the skylight rooms of the Aargauer Kunsthaus a subtle crackle and crunch can be heard. This noise can't be sorted in by exhibition visitors immediately, because they are in a museum. This ambivalent situation keeps visitors irritated and fources them into different possibilities of interpretation. What was that? A subliminal noise, with different intensity, irregularly recurring. It resonates with the museum and its construction - although relatively quiet, it goes to the bone. Perhaps it is caused by changing climatic conditions in the room of the skylight? It is assumed that the noise causes hitherto could not be turned off and the inevitable material movements were accepted. Acts of God ? This noise is now called Sabina. If one takes this noise as a work of art, art and building would no longer be separated. Ought the sound continue to be a random, the building would remain separate from the work of art. 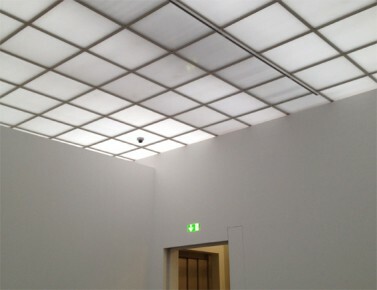 The interpretation of the noise as an artwork, summarizes the construction of the Aargauer Kunsthaus inviolable as part of a de-limited work of art. Sabina is connected at the mercy of the Aargauer Kunsthaus. More than that, Sabina is the Aargauer Kunsthaus itself and the Aargauer Kunsthaus is Sabina. This is done without manufacturing and material operations in the studio of an artist, without art transportation, museum handling, even without the invitation of the museum's management. It is noise-free noise production in an anechoic chamber of interpretation and solely changed by the perspective of the viewer. Acoustically remained the same noise, Sabina is no more background noise, bad lead noise. She enters, effectively and attractively the stunning resonance chamber of contextual reflection. The complaining authorship of the artist Fritz Balthaus to the noise would like to suggest seeing the art in an extremely heightened dynamics of money, prestige, security and power. Future considerations could explore new interpretations, new forms of attentions and speak critically about the new and old forms of permanent and temporary property. Who does own the world, who owns the museum world? Who owns the interpretation of real and volatile phenomena, both, inside and outside of museums world? To what extent do those worlds belongs to the curators, and to what extent do those worlds belong to the artists? Where does the right measure and where begins the presumption. Where are the limits of curatorial and artistic attention and where lives the art? Who owns the museum, and who does not own it. In addition to the curatorial job of a custodians there is the artistic self- commissioning of artists. How do those differently shaped freedoms find each other? Are there any intersections? Or must the whole art system and its inhabitants be only eager to assert themselves. The branch, in which Sabina now dwells, has become cracked. As foreboding Muse Sabina brings the museum construction to tremble. Although the director of the Aargauer Kunsthaus has rejected the curatorial acquisition of hers.